Bouncer was created by prolific Play Store developer Sam Ruston, who has made popular apps ranging from a (now unpublished) Google Material Design Award-winning weather app to a crowdsourced toilet finder. The new permissions service, which costs $1, takes advantage of Google's set of tools for accessible app development, which is designed to help in creating apps for users with disabilities. 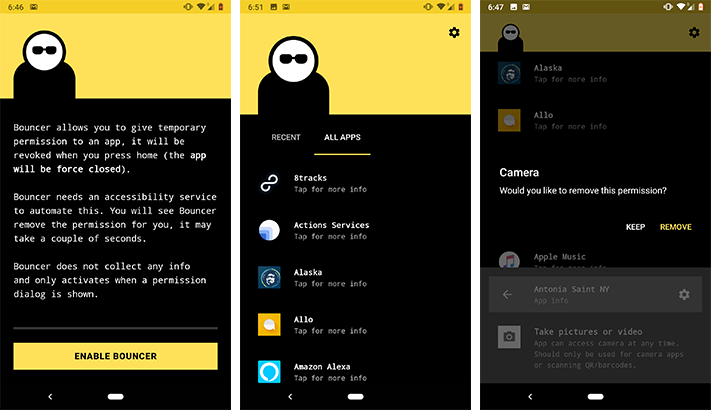 In this case, it provides an option for controlling recently granted permissions that allows Bouncer to open an app's settings and remove a permission (like camera use or location tracking) as soon as you leave the app and go back to your phone's home. Of course, you can set which apps you'd like to do this with, and which are exempt. If you're skeptical that an app with so much power wouldn't misuse it somehow, the Google Play page assures users that Bouncer requests no permissions, cannot see info inside apps except for the settings app, and doesn't have internet permission (so it couldn't transmit info, even if it could get it). The use of Accessibility Services for anything except helping people with disabilities was on somewhat shaky ground last November, when Google alerted developers of a new ban on using the API for anything except helping users with disabilities. This would have affected apps including LastPass, Button Mapper, and Signal Spy, among others. However, in December, Google walked this back, suspending the ban and writing that it would take into consideration how developers could use the Accessibility API for a "responsible, innovative purpose that isn't related to accessibility." It's been a while since we've heard anything on this front, but that's probably a good sign for apps like Bouncer — which is very much responsible and innovative in its use of Accessibility Services. The only question is whether you'd rather manually manage permissions rather than spend $1, but if you're a user of many apps, it certainly might be worth the time you save.